I'm having a similar issue with my 95 E7 VMAC 1, I found this post useful however I still havent solved my issue. Bench tested the solonoid that stops the air to the fan and it works (Clicks when 12 volts applied). Fan clutch disengages when I disconnect the air line so I know it works. I tried the following procedure today to attempt to rule out ac high pressure switch: With the air pressure up and the engine cold, I turned the key on, unplugged the high pressure switch and jumped connector with paper clip, nothing happened. I think the solonoid on the side of the radiator should have clicked if the high pressure switch is the problem? also tried the same method with the coolant temp senor,and nothing happened either. The ECM on the truck has been replaced and the fan was staying on prior to replacing. I looked for the fuse however my truck only goes to number 24, I guess since its older then the one in this thread. I believe my coolant level sensor is in the water manifold towards the front of the truck, as there doesnt appear to be any wires going to the top tank (However I didnt climb up there and look at the back). Appreciate anyones suggestions on how to diagnose, fan belts keep stretching and squealing as a result of fan running all the time. I know I could easily install a manual switch on the fan, however the truck is in really good shape and I hate to bypass a factory system. I noticed the Turbo on my 95 E7 400 is leaking oil in the center. Its a pretty decent oil leak, dripping down on the injection pump. Is this a sign of potential Turbo Failure? The leak is around where the oil fill tube connects to the Turbo below is I picture I pulled off the net to show where the leak is (its not my truck but the same setup). Truck has almost 450K on it, the turbo seems to have markings on it like it was engraved from a junkyard, I've owned the truck for about 18 months so I dont know the history. Last time I drove it it was putting out 30lbs of boost under load, I seem to recall it used to go up to 35. (I dont drive it that often) Appreciate anyones thoughts! I feel your pain on this-I have a 95 e7 400 that I was getting the same codes & engine derate. I was able to make the 3-4 go away by changing the sensor in the side of the pump, the 3-5 ended up being the ECM. If I had it to do all over again I would just bite the bullet and take it to Mack. I blew $500 on a new econovance solonoid trying to fix it myself, then the shop I took it to charged me their labor rate to throw parts at it themselves, they changed the timing sensor in the flywheel housing, rebuilt the actual econovance unit, and ultimately the ECM was the problem. Runs great now, but it was a complete nightmare! I wish you luck whatever you decide to do. ---Also I made the same mistake of thinking the 3-5 code was Jake Brake Solonoid instead of Timing Acutator, guess you cant believe everything you read on the internet. Put the truck in the shop finally...they had a hard time and its a long miserable story but it seems the problem was the ECM. They also fixed my exhaust manifold leak & installed new injectors (they put high flow ones in, I'm told they are mild) It was ran on the dyno to verify the repair & that the timing is correct, It put 369HP to the wheels (I was given the printout). The torque number on the printout is crazy high, I think you have to divde by the gear ratio which gives me 1549 ft lbs to the wheels which seems consistant since from what I can find on the internet an E7 454 is rated @1660 to the flywheel. 2 days so far with no derate! Are you sure its set at 400 HP? 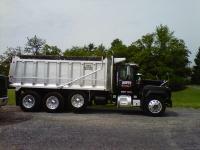 The only reason I ask is we used to have a LTL with a 400 Cummins & 13 Speed, also had a 78 R Model with a 300 & 6Speed and 20MPH Difference on a pull seems about right to me (Both Tandem Dumps Hauling 65K) You also have to remember that Cummins is 855 Cubic inches and the Mack is 728 (Pretty sure), and if the Cummins is turned up any, the Mack will never run with it. I dont think a transmission swap would have a great enough effect on how it pulls to be worth the time & money. I would have the motor checked to verify current rating. Mack 300 engine.. pros and cons? First truck I ever drove was a 78 R Model with a 300+ and 2 stick 6 Speed. I would say power was good for what it was, especially since it had that tiny intercooler box. This one may do better with the 13 speed, but given that its geared to run 85 I'd say its not going to pull too well. The truck I drove would run 63 @2300. My 1995 E7 400 (when its not in derate mode) runs SIGNIFICANTLY stronger, and its only geared to run 73. Sorry, I'm not a tech or anything. The one I posted was found on the internet while trying to solve a problem with my truck.